It is only above the Arctic Circle that the true "Midnight Sun" occurs during the summer months, and is when the sun never dips below the horizon. It`s possible to watch on the Island of Grimsey from the mountains close to Olafsfjordur from the northeast coastline near Raufarhöfn, just 2,5km south of the Arctic Circle. Even without the true Midnight Sun, real nights never falls during June and July. The sun only skims below the horizon at midnight. The west coast of Iceland becomes an excellent viewing platform for witnessing one of the natures most magnificent shows on Earth - the setting of the Midnight Sun. The sun then remains dipped just below the horizon casting an enchanting spell of glorious illumination until it rises again at dawn. In Reykjavík, you are well situated for scenic observations of the Midnight Sun with some fantastic locations to take photo snapshots. Regarding tours and sightseeing options the light increased to extraordinary adventures. You never need to get somewhere before it gets dark’ – because it doesn’t get dark. You can go on a tour like Golden Circle Midnight Tour, Midnight Sun Horse Riding Tour or hike a mountain during the Midnight Sun. You can even go caving during the Midnight Sun. Discover the Midnight Sun through a marathon. 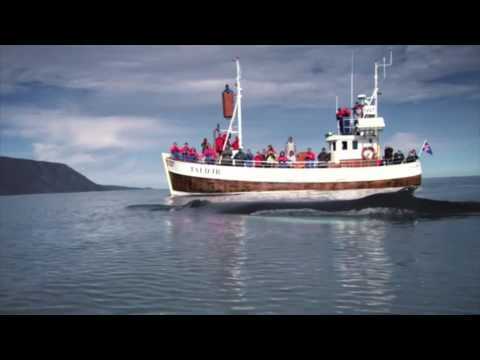 Join an unforgettable organised whale safari on your Iceland tour.